What if you walked into work one day and your boss handed you a magic wand? The actual charge was a little less dramatic, but that’s the gist of what five Chelan County Public Utility District (PUD) employees heard at the start of a workday in early January 2015. Over 20 days, the team mapped every aspect of the electric service line extension process. Then they worked to figure out what could make it easier for customers. Finally, after intense review, the team stepped back and identified more than 70 actions that could improve the process. “Having a forced deadline really got the adrenaline going,” said team member Chris Peterson, Chelan PUD customer service engineer. Employees realized that “the way we do things” had become invisible internally, but were glaring shortcomings for customers. Knowing that they wouldn’t be able to accomplish all 70 pinch-points within four-weeks, they set about breaking up the actions into manageable assignments. First, there were 50 improvements that could be done immediately. Then they set plans in motion to accomplish the other 20 in the next six months. Finally, they designated four proposals as “the big ideas,” which required planning and coordination across the utility. These were measures that might require a couple of years and additional budget to achieve. 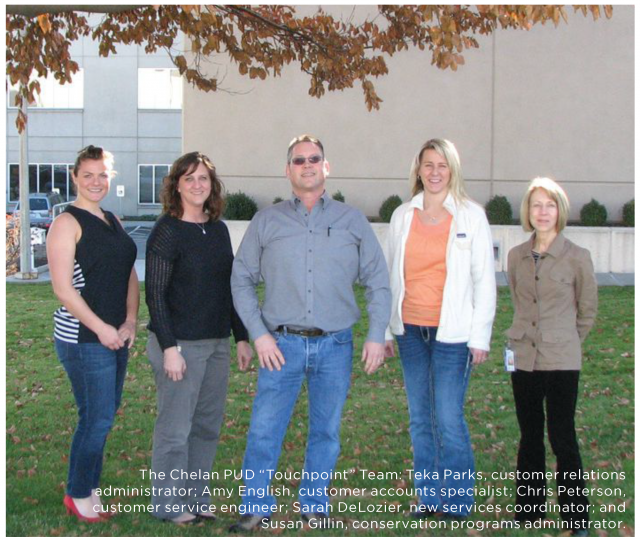 “What Chelan’s Customer Experience Touchpoint Team achieved set the stage for future projects,” said John Stoll, Chelan’s managing director of customer utilities. Customer satisfaction is a key metric for the utility and Stoll searched for an approach to ensure that the utility achieved higher success. Stoll consulted with customer experience expert and author Roy Barnes of Blue Space Consulting. He heard Barnes speak at a course for utility executives at the University of Idaho, and was inspired by the approach of helping employees take a fresh look — from the customer’s point of view — at each contact. Last fall, Barnes provided training for many of Chelan PUD’s front line employees. The training clarified a new awareness of the obstacles — many unintentional — that stand in the way of customer satisfaction. These ranged from the trivial to the tangled: from unsightly, faded pictures in the lobby to convoluted payment methods. Employees realized that “the way we do things” had become invisible internally, but were glaring shortcomings for customers. The next step was to use what employees had learned to launch the Utility’s first Customer Experience Touchpoint Team. “The first exercise was using ‘new eyes,’ which sounds easier than it was,” recalled Peterson. The team began by walking through its front door and into the lobby. “Not only did we notice the fading paint and pictures, and peeling signs, we saw some real barriers for customers trying to apply for a line extension,” Peterson said. Chelan PUD received more than 100 residential line extension requests last year. One of the biggest barriers to customer satisfaction is that customers can’t apply for a line extension in the PUD’s main building, and there’s no easy way to get to the service building, where the applications are taken. And if customers do make it to the service building and apply for a line extension, they had to return to the main building to pay the fee. Rather than writing notes, the team made a YouTube video to illustrate the mounting hurdles that customers encounter during the application process. The video isn’t meant to be funny, but it has triggered a lot of nervous laughter J when shown at employee gatherings. Armed with the facts on what customers face, the team listed what needed to 25 change, and solicited ideas and help from coworkers. “As the list grew longer, one thing that helped keep our team on track was the realization that little things matter,” said Amy English, a customer accounts specialist. One by one, they worked down the list of all the contacts made with customers as a line extension request is fulfilled. For each item, the decision was to update, modify or delete. Then there are the items that will take long-term planning, budgeting and coordination. One includes offering customers the ability to track the status of their line extension online. “If Domino’s Pizza can do it, we should be able to do it,” Peterson said, referring to the company’s Web app that allows customers to view their pizza order from dough, to oven, to delivery. Another big idea is moving all of the utility’s “customer-facing” employees to a single location to create a one stop shop for customers. Currently, the employees are scattered in three locations on the headquarters’ campus. Team members said that providing more information at the start would have eased some of the tension that came with pushing hard to accomplish as much as possible in 20 days. Some of that tension arose from Touchpoint Team requests to other company departments. “We caught some people by surprise,” said Gillin. Team members said they enjoyed being empowered to make decisions and to put them in place. In March, the team presented the results to Chelan PUD’s Board of Commissioners. The commissioners applauded the team’s accomplishments. “The simplest things have the biggest impact and I think this headquarters campus map is one example of that,” said Commissioner Carnan Bergren. General Manager Wright also praised the team and Stoll’s leadership. “He’s really been a great champion for the customers,” Wright said. Time will tell if customers agree, but customers who apply for a line extension will be emailed a survey about their experience and the results will guide future improvements. Kimberlee Craig is Chelan County PUD’s public information officer. Following a career in reporting and editing, she is in her 16th year with the District.